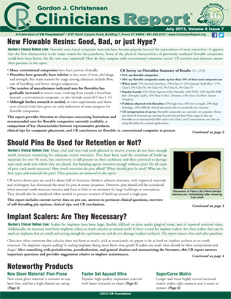 New Flowable Resins: Good, Bad, or just Hype? Should Pins Be Used for Retention or Not? Implant Scalers: Are They Necessary? • Are bonding agents adequate without pins? • When should pins be used? • Do pins crack teeth? • Should implants be scaled?